Christine Shulse loves fat. While I spend my day avoiding it at all costs, Christine looks for fat in new places, studies how it's made, and even thinks about engineering ways to make more fat. But Christine isn't studying the fat in my french fries – she's studying polyunsaturated fatty acids, or PUFAs, the heart-healthy fats found in expensive fish oil supplements. PUFAs are powerhouse lipids that are good for our cholesterol and have been the focus of medical studies on everything from weight loss to cancer. They can be found in fish, eggs, chicken, and healthy oils, but Christine is looking for a new and inexpensive source of heart-healthy lipids, and her work may even help us understand how to make biofuels, such as fatty-acid derived hydrocarbons. Christine is a graduate student in Dr. Eric Allen's lab at The Scripps Institute of Oceanography, and she's discovering a source of PUFAs, a form of secondary lipids, in bacteria: "Generally I'm interested in the production of secondary lipids by microbes," she says. "Similar to secondary metabolites, secondary lipids are lipids that have not been shown to be necessary for the normal growth, development, and reproduction of these microbes under laboratory conditions. Therefore these pathways can hopefully be messed with without upsetting the cell's primary metabolism." This would allow Christine to artificially produce more or less secondary lipids in a microbe without affecting its health, which is important for engineering bugs in industrial settings. Christine studies both hydrocarbons and PUFA secondary lipids, and the synergy between the two is key: "The hydrocarbons could be used as fuel, while the fatty acids are important in human nutrition and are used as nutraceuticals. So with the knowledge of how to make that switch industry could decide which product they're interested in and then have the knowledge to optimize production of that product." 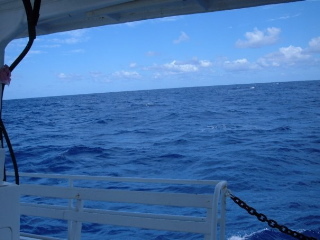 Christine's work utilizes cutting edge DNA sequencing technology and bioinformatics as well as environmental samples from all over the world, including bacteria from Lake Tyrell in Australia and even samples from 6000 meters below the ocean surface in the Puerto Rico Trench. She hopes to discover and understand energy-containing molecules that are already being made in nature and is searching for these molecules in extreme environments. "I have surveyed various environments for the genetic signatures ultimately responsible for the production of secondary lipids so that we can get an idea of the diversity and distribution of secondary lipid production in nature," she says. She has also scanned every sequenced genome (millions of genes worth of information) from algae to cyanobacteria to protists, looking for genetic signatures of PUFA and hydrocarbon production. Christine analyzes every gene expressed by microbes that produce secondary lipids through high-throughput transcriptomics, or the study of gene expression in the entire organism. She looks at changes in gene expression when you change the microbe's environment, trying to decipher the triggers of lipid production. "I'm quantifying the trade-off between hydrocarbon and fatty acid production in a group of marine bacteria called Shewanella," she says. As a graduate student in an SD-CAB lab, Christine had the opportunity to present her work at the monthly SD-CAB symposium this past spring. "I love SD-CAB!" she says. "The Student and Post-Doc symposium is a great venue to polish a research presentation and also to connect with colleagues interested in the same problems." 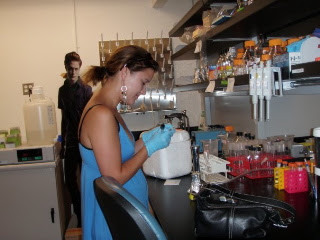 Being in SD-CAB helps her to interact with some of the best algal biotech minds in San Diego: "The feedback and questions I got when I presented at the SD-CAB symposium in January helped me publish a paper on that work in May and then present it in a more polished form at the American Society for Microbiology General Meeting in New Orleans." This summer, the Allen lab is even hosting an SD-CAB summer undergraduate intern, Michael Mayfield. Michael is working closely with Dr. Allen on a project that compliments Christine's work, scanning new microbes for secondary metabolite production and trying to find strains that make these important molecules. Christine's work and the work of the Allen group may one day leave the lab in pill or gasoline form, and while it won't make my french fries healthy, it may replace expensive fish oil supplements or help reduce the environmental impact of our energy needs. 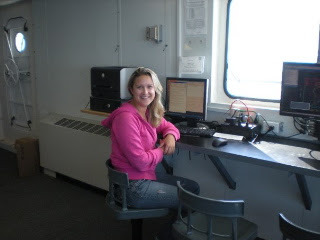 Britt Flaherty is Ph.D. candidate at UCSD and a volunteer writer and outreach coordinator with SD-CAB. You can contact her at blflaher@ucsd.edu.